When I was born, nearly fifty years ago, my own Dad wasn’t allowed to take any part in my birth. My Dad was English and had none of his own family here in Australia. My mum went into labour and with no phones at patient’s bedsides or mobile phones, he just had to wait for news of my arrival. My mum was in labour for a few days with me ( sorry mum!) and my poor dad was beside himself as he got so very little information, just a “Mrs West is doing fine.” from a terse charge nurse on the few occasions was brave enough to call to seek information. After hours of being truly convinced that something tragic had happened to both of us, and my maternal grandparents asleep, my dad decided to camp out late at night at the hospital front door. Finally at two in the morning the GP that attended my birth came out and assured him that all was well and that he had a healthy baby girl. Seeing my dad’s distress, the GP arranged a quick five minute visit with my mum to see for himself that all was well. This was an outrageous move and the Nuns and night charge nurse were not amused by this stunt. My parents were very grateful for the compassion of this wonderful doctor that cared for our family’s health until he retired. Sadly I heard news that the GP died just recently, and he will be fondly remembered for his kindness and standing up for fathers that needed him to act on their behalf. This story is not uncommon from my generation. Thankfully, things have changed for the better for our recent and current parents. Father’s are now encouraged to be part of the pregnancy and birthing process with their partner. Dads are a common site at antenatal visits and are expected to be by their partner’s side during birthing. This is such a welcome change of attitude for all stakeholders and most of all the child. Caroline and I have seen an increase in the number of men that meet with is in regards to their child’s sleep. Not just dads that have been told to be present for our visit, but interactive dads who bring a lot of information and their own questions to the table in the quest to improve their child’s sleep. We see more and more dads at our Baby Sleep Workshops and they are great contributors to our discussion. 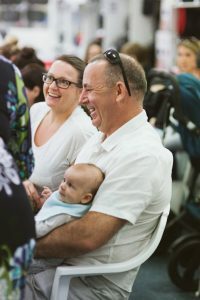 The men comment on how good it is to be welcomed in parenting discussions that they are very interested in and how much they learn about why their babies are so wakeful and what they can do about it. Some are the primary carer while many are actively involved in the care of their child and household duties in addition to their paid work commitments. It is just my opinion, but I can’t help but see the positive spin offs from having father’s encouraged to be involved in their child’s lives from the start. This provides wonderful support for the pregnant mother, going through this deep and powerful experience together. For her partner to be present at the time of birthing and seeing his partner in a different light after this experience. I used to work as a birthing suite midwife for well over ten years. 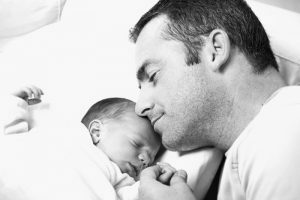 As much as I enjoyed working with labouring mums and being totally fascinated at how amazing the female human body is in labour, I also loved being around the new dads that were totally in awe of their partner. Amazed at her strength and endurance as a part of birthing their child. This intense and new appreciation has a ripple effect that he is more likely to be attentive to her needs and support both mother and child during the often exhausting newborn period and beyond. By being present in bringing his child into the world with often with a hands on experience or cutting the baby’s cord, he is more likely to hold and be involved in the baby’s care from that day. This closeness to his child weaves into a stronger bond and love between them that is long term benefit to both father and child. I was lucky enough to have my own husband close to me in the birth of our children. I elected to birth my babies in the same hospital that I worked at, I was very familiar with the Midwives and place that I would meet them, this was a great comfort to me, but a greater comfort was having my husband close by. I just felt safe and well supported. I am not much fun in labour ( I vomit a lot and don’t really want to talk to anyone) so as my second child’s due date was arriving, my husband thoughtfully invited my dear friend to attend the birth to keep him company. Amanda looked nervously at me and I agreed that would be ok. So as it went to plan Amanda joined us in the birthing room when things were in full swing. I was doing my expected introvert labour and in labouring pain I was standing up doing my best to get through each contraction. My husband sitting close by just gently stroking my leg. I couldn’t talk to him but I was comforted by his gentle touch and closeness. He knew that baby was coming fast and decided to go to the toilet now so he didn’t miss the birth. He called Amanda and showed her exactly how he had been comforting me and got Amanda to take over. I hadn’t realised they were swapping but I distinctly remembered the abrupt change of touch. It didn’t feel right. It was annoying me I flicked her hand away. Soon my husband returned and resumed his gentle touch, the relief was enormous. I relaxed enough knowing he was back in the room to birth our baby a few contractions later. As I stood to birth my husband stayed close with the guidance of my gorgeous Midwife and helped her bring our second child into the world. He was overwhelmed and delighted in equal parts. The connection to our son was instant. I often had conversations with nervous partners in during labour. They told me how useless they felt, they didn’t know what to do our how to be of help. I told them just by being here, just by being close that they were doing something very powerful without even knowing it. I encouraged them just to be present, that their partner would remember this, not what they didn’t do. I remember attending an education session quite some years ago. Research was presented that I was fascinated by. Sadly I have not been able to find this study again to link to this article but I will keep looking. The research found that there were some interesting findings of children and in particular boys, that had their father in close proximity to their mother throughout her pregnancy. We know that once the egg is fertilised by the father, that is where his input to the child’s development stops…..or does it? 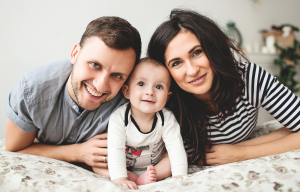 This research had looked into a hormonal difference in women that had their partners close to them in pregnancy as opposed to the baby’s father not being in close proximity to her in pregnancy. They found that male children had a difference in finger length depending upon how much their father spent time near to their mother in pregnancy. The irregularity in length of the second and fourth fingers were greater. The boys with more absent fathers had more equal length of their second and fourth fingers. The boys with the more irregular length were also found to have athletic strength and abilities, making this something that sporting talent identification looked for in boys. The research was indicating that a woman’s pregnancy was altered by testosterone levels around her. Other studies have also lead to this line of thinking by noting that present fathers around their pregnant partner had higher birth weight babies and less pre-term deliveries. I am looking forward to seeing more studies in this area in the future. After the education session that I attended with this information, I came home to my two sons who were young teenagers and asked them to hold their hands up for me to see. Curious they did as they were asked and both sons had the irregular length second and fourth fingers that I had seen earlier in the research. My husband (God love him) had been a very interested and attentive partner during both my pregnancies and it seems that science was now proving that to be true on another level. I then started to have a new appreciation for his role in raising our sons, far before I believed it began. My husband and I have both lost our own fathers but are very lucky to have father figures in our lives that offer advice and the village that our own genetic fathers can no longer provide. We don’t have to be related to appreciate the kindness and wisdom they bring into our lives. Our youngest son Nic turns eighteen this father’s day so we have a double celebration. In true fatherly style, my husband will take a back seat to the birthday celebrations, but we will make sure he is made to feel special for all that he has brought to our family. That seeing his son reach adulthood is a gift that he has been unwrapping for the past eighteen years and nine months. Happy Father’s day to all the dads, grandfathers and father figures that we have in our lives and a remembrance of those that can no longer be with us. You are far more special than you think and we love you all for it.